Which brings me to today’s wedding cake. 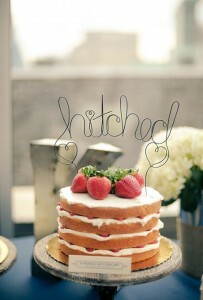 This lovely, simple one-tier cake adorned with strawberries. Given that it is a naked (sans frosting) cake, the addition of strawberries gives it that added pop of color that would otherwise be missing. The vanilla cake with white icing would be rather boring without that peek of red from the strawberries between the layers. The circle of bright red berries on top of the cake is perfection too. This cake would be lovely at a spring or summer wedding! You’ll find the cake here. It was created by Dulce Desserts.